With 2.10 finalized and humming along on thousands of systems, it’s time to start deciding what to do for the next release. With the current trend of double digit release numbers, maybe we should name it 11 instead of 2.11? If you have an opinion feel free to express it but for now let’s discuss more interesting topics, like what should be in it!! Some of us developers got on a phone conference last week to start this dialog. We’ve got some ideas which I’ll express next but as always we want to hear from you! For starters, our general consensus was to target the next Astricon for a release timeframe. Astricon is held annually towards the end of October, so that gives us about 7 months from now. We kept the discussion at a high level with the expectation to summarize here and begin to get your feedback on things to work on. From an Asterisk perspective, we will support the current LTR (Long Term Release) of Asterisk 1.8, plus 10 and 11 which will be the next LTR due out about that time also. One big change in Asterisk 10 is the rewrite of the [i]ConfBridge[/i] application. MeetMe has been the [i]”primary”[/i] conferencing application prior to 10 but has some problematic requirements which also keep it form handling wide band codecs. The Asterisk team rewrote what looks to be an awesome new version of the ConfBridge application which has so much flexibility and power that it deserves a complete rewrite of our conferencing module in FreePBX! In order to get some early exposure to the new ConfBridge, we’ll add support in the current Conferencing Module for FreePBX 2.10, but the real flexibility won’t come until the module get’s rewritten! The biggest undertaking for 2.11 is to finally replace the User Portal (ARI – Asterisk Recording Interface) with a new and modern version that is written from the ground up. Schmooze Com, Inc has stepped up to the plate with the current intention of leading up this effort and providing significant contributions to the rewrite.This will be an ambitious undertaking and we are very excited that it is en-route to becoming a reality! Another technology we discussed investigating is the ability to remotely monitor [i]ExtensionState[/i] information (Asterisk [i]”hints”[/i]) between two or more PBX systems. This underlying technology uses XMPP as its transport mechanism and requires an outside XMPP server to configure and run. Potential applications range from BLF enabled buttons that monitor remote extensions at another branch, to ExtensionState information about remote queue members being available to the local queue, to separate Voicemail Servers with MWI information available locally and more. Our starting point will be an investigation and then explore what we might do to take advantage of it. Ward (from Nerd Vittles) indicated some interest in getting a test bed up and going but if anyone else out there wants to join the party and help with the effort you would be more than welcome! We’ve also started exploring the Call Event Logging (CEL) infrastructure added to Asterisk 1.8. The CEL is an event based subsystem with the focus of comprehensive [i]”billing”[/i] systems in mind. Today, we have the CDR records that form the basis of our call reports. These have some use but a lot of limitations and can often be difficult to read. What becomes particularly hard is to try and track a complex call that may go through various stages such as attended and blind transfers, call pickups, parking and more. With CEL, you will get MANY more events from a given call, but it’s possible to process those events in such a way that we can group all information related to a single call which becomes quite useful for someone trying to bill for or otherwise account for a full call flow. The CEL subsystem is quite flexible so there are a lot of possibilities available. We expect 2.11 will be just the beginning! There was some additional discussion including what level of support we should or even could provide to Google Voice if a developer were able to commit to keeping after it, as well as CallerID Superfecta which currently is not at all in our control as it is not even housed in any of our repositories. For the most part though, we were looking at the above “bigger” technologies we want to play with and hopefully introduce and then come here to start asking you to throw out your ideas. We will be digging through the feature request tickets as is always the case but your comments are very welcome here so please feel free to fire away! As a quick side note, May is approaching faster then expected, as well as the end of March deadline for Early Bird Pricing on the upcoming [url=/open-telephony-training-seminar]OTTS training coming to Minneapolis, MN[/url] so if that’s something you are considering don’t procrastinate too long and miss out on the savings! Signups have already started and the last two events ended up selling out so make sure to reserve your spot! 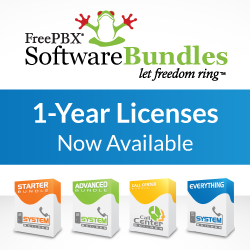 For now, let us know what your ideas are for the next FreePBX release!